Last March, Vadim Makhorov and Vitaly Raskalov, two 20-year-old extreme "roofers" from Russia, reached the top of the Pyramid of Cheops in Egypt. RBTH spoke to Makhorov about the endeavor and what the future holds for the two climbers. 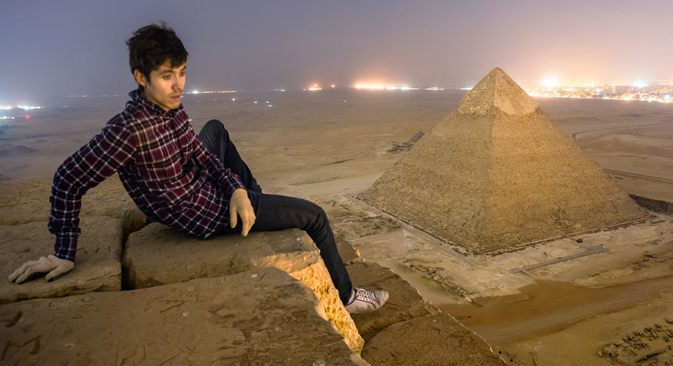 Vadim Makhorov and Vitaly Raskalov received their slice of international fame in late March 2013, when they scaled the Pyramid of Cheops in Egypt and captured the result on film. For them, it was the beginning of an international career and the seed of a new business concept. Before venturing abroad, Vadim Makhorov, a 20-year-old from Novosibirsk, started out climbing up roofs, dams and drainpipes in Russia. His most recent outing was a nighttime shoot atop the Pyramid of Cheops (the Great Pyramid of Giza). For Vadim, it is both a hobby and a profession, and, in the future, he thinks that "roofing" could become a good business. RBTH spoke to Makhorov about how he and Vitaly Raskalov climbed the pyramid and what the future holds. RBTH: What made you go and climb up a pyramid? Vadim Makhorov: We saw a lot of information online and even photos from the top taken at different times by different people, so we decided to try it for ourselves. RBTH: I have to ask — why? Why go clambering up roofs, pyramids and drainpipes? What's the appeal? Vadim Makhorov: Everyone has their own purpose: some are looking for an adrenalin rush; others do it for the peace and tranquility at the top. My personal goal is to take beautiful photos. Although, to be honest, the climbing part is a really cool thrill that you remember for a lifetime. RBTH: Did you go to Egypt as tourists? Vadim Makhorov: We arrived in Egypt from Dubai and found accommodations in the heart of Cairo on the square that was occupied by demonstrators. On the first day, we climbed a couple of buildings in Cairo — including the tallest building in the city — got a bird's-eye view of the place, and planned ahead. We were set on the pyramids. We tried to get away from all the tour guides who trample over each other just to get to a foreigner. Everyone wants to cash in on tourism. So we tried to do everything ourselves. By the way, you have to spend a couple of days in Cairo, especially if you're feeling down. It’ll clear your head of all the crap: an overcrowded city with jams even at night, no traffic lights, home to 30 million people. Young thrill-seekers from Russia from Russia Beyond The Headlines on Vimeo. RBTH: How did you get to the pyramids? Vadim Makhorov: First by subway, then a local bus to the complex — the bus ride cost two Egyptian pounds. We walked around, took a look at the tombs and waited for it to get dark. We didn't yet know if we'd be able to do the climb, we just eyed the pyramids. But, apparently, it was in the cards that we had to try. We were left alone, watching the light show at the pyramids. And when it finished, we scaled up them, did a spot of filming, then went down and off unseen — we didn't notice anyone either. Only later did we learn that we had broken the law, for which I apologize. RBTH: Was it difficult to climb? Vadim Makhorov: It was all large blocks, about waist-high. Easy to climb and descend, if you're fully in control of your actions. But one misstep and you're dead. That's the danger. RBTH: You travel all over the world, climbing up roofs. Is it your main occupation? Vadim Makhorov: My vocation is photography. Roofs and high-rise buildings are what I started out photographing — and still do — but I also shoot production facilities, make virtual tours, etc. I've really only just started going to other countries. Before that, I toured Russia with Vitaly Raskalov, climbing roofs. And when we ran out of cities here — I mean, ones good for high-altitude filming — we went abroad. It's only the beginning. We want to launch a project based on such travels. Take a lot of photos and make videos — amaze the world. RBTH: Have you had any problems with the authorities? On other rooftops? Vadim Makhorov: In Russia it's not a big deal. The maximum penalty is a 500-ruble fine [about $16]. In other countries, we've not had any problems so far. I hope there won't be. There have been times, of course, when security pulled us off a roof; but when we explained what we were doing and showed our pictures, they softened up and let us go. In Russia, security always calls the police, for which they get a small reward. RBTH: What's the neatest climb you've had? Vadim Makhorov: It's hard to pick one, because each is about striving toward a goal and the achievement and triumph of reaching it. To be honest, the last two trips — first to Berlin, and then straight on to Dubai and Cairo — stand out the most, probably because they forced us into the right mindset and gave us ideas and objectives. We got a taste for more. It renewed our desire to shoot killer videos about our exploits. We picked up some new ideas for photo exhibitions outside of Russia, ideas about how and where to go, and about a joint travel project.